Over the last year we have done many fundraising activities and applied for various grants from local companies. The support we was given has been amazing and we have now managed to purchase. 6 new Patrol tents, 4 new Vango hike tents. We did receive 2 substantial grants from Joseph Rowntree and from York Children's Trust. Thank you so much for your help and also to anyone else that has helped us. Where was you on Sunday morning at 5am?? We was sat in a queue of cars waiting to set up a car boot sale. Even though it was a very cold start it did warm up a little as the morning went on and we managed to stay dry. At the end of the day we also managed to raise £175 minus the bacon butties. Fantastic news Norman Collinson Charitable Trust has donated £600 to help us purchase some camping equipment. From every one at Osbaldwick Scouts Thank You! 1 More leaflet drop completed and another £250 pound donated by Joseph Rowntree Housing Trust. We was informed on this leaflet drop that we looked to old to be paper boys. Enough cooking equipment to be able to camp at anytime without the need to borrow items from other groups. Its the final push now and we are going to keep fundraising to purchase some tents. If anyone can help or has any ideas please contact us with details. J H Shouksmith & Sons Ltd of Osbaldwick donate £250 to help purchase new camping equipment please click to read the full story. The scouts have again completed a 24 hour sponsored cycle ride. This 24 hours felt and seemed longer than the first one we did. This seems to becoming a annual event and the scouts really enjoy it. The scouts have even asked if we can do a 48 hour ride next year. Just to let everyone know that wont be happening. One more leaflet drop done, another cheque in the bank. This time it was not just the leaders delivering them the socuts was out on Friday night, Although they wont admit it they did enjoy it. A SCOUT group from York has cycled hundreds of miles to raise money to buy camping equipment. The ten to 13-year-olds cycled for 24 hours, starting at 7pm on Friday and finishing the following evening. 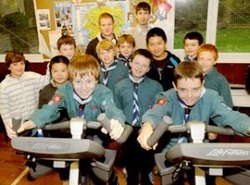 The group was loaned two exercise bikes from ROKO gym at Clifton Moor, and carried out the marathon ride at the Osbaldwick & Murton Scout hut. Ian Bruin said the event was a lot of fun, but was disappointed to find out the distance was not measured. He said: “The bikes reset themselves every hour, so we don’t know exactly how far we went,” he said. 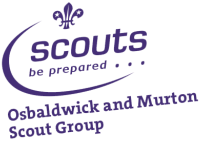 The Scout group has been running for three years, and the camping equipment is almost 50 years old, meaning equipment had to be borrowed for the group of 15 scouts to go on trips.